Often the first exercise I do when delivering a CPD session or example lesson is one using sound. Sound carries far more emotion than the visual content of films. Hollywood directors say that up to 80% of the films emotional content is in the soundtrack, note – not the actors performance, not the story, not the explosive special effects. It is possible to watch a horror film and not be scared simply by turning off the sound. Here is an outdoor set. 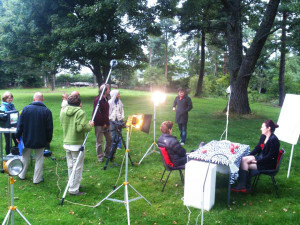 Can you spot the sound recordist? Where is the microphone? There are some great exercises to do with the sound track. 1. Find a great film with a great sound track and just play the sound (hide the screen), ask the class/group to write down what they hear. Share and discuss their thoughts. 2. Create your own soundtrack while a film is playing. 3. Use a sound track to write a story (without seeing the film first). 4. Make a storyboard for a piece of music.